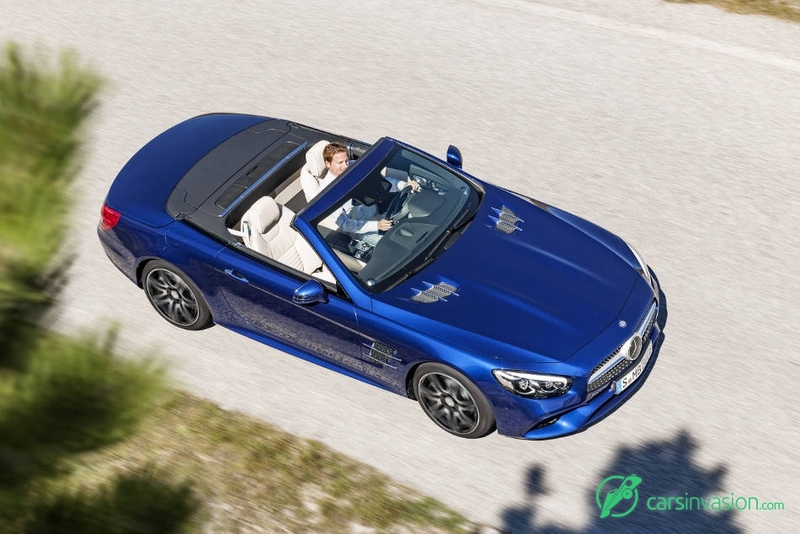 Additional variants include the two Mercedes-AMG models in the guise of the SL63 and SL65, the latter with a V12 engine. 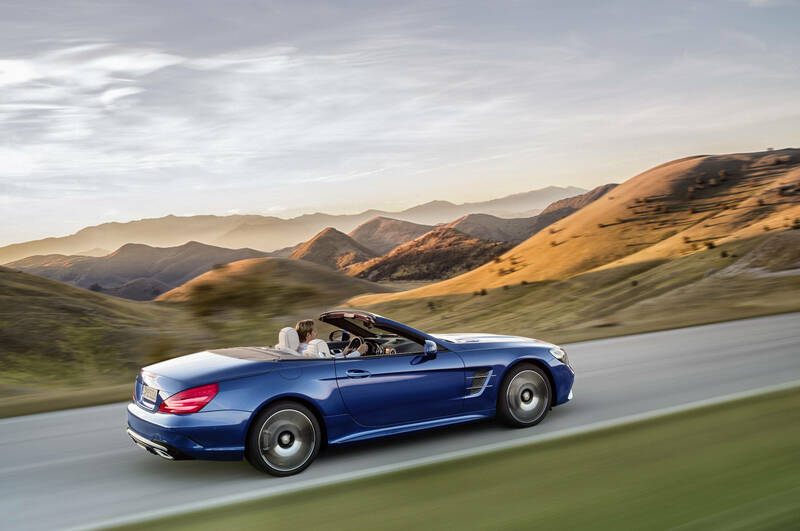 The Mercedes-Benz SL has always been athletic and aesthetic at the same time. Now the designers have worked on bringing these characteristics even more to the fore. 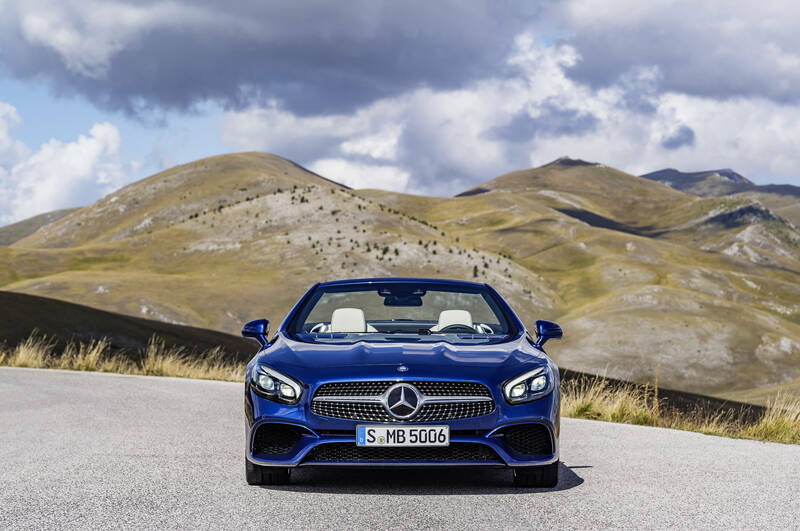 A particularly eye-catching feature is the revised front end of the new edition of the SL: for its new appearance, traditional elements have been enhanced in an innovative and unmistakable manner. Inspiration came from the legendary 300 SL Panamericana racing car with its steeply raked radiator grille. 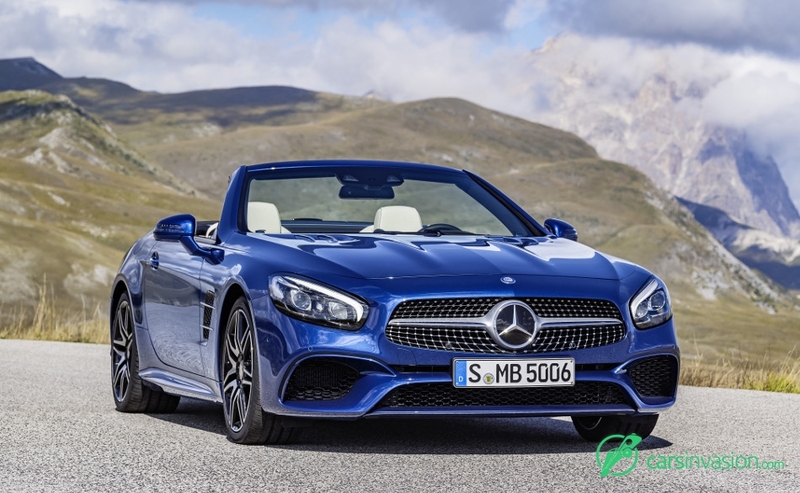 This extends downwards, thus creating a completely individual "face" for the SL within the Mercedes-Benz model range. The grille is executed as the diamond radiator grille as standard. The sculpted shape of the radiator grille harmonises perfectly with the now standard AMG bodystyling with the front apron in an A-wing design, which features a front splitter in the vehicle colour. Two powerdomes on the bonnet invoke the sporting heritage of the SL, while light-catching contours give additional structure to the bonnet. 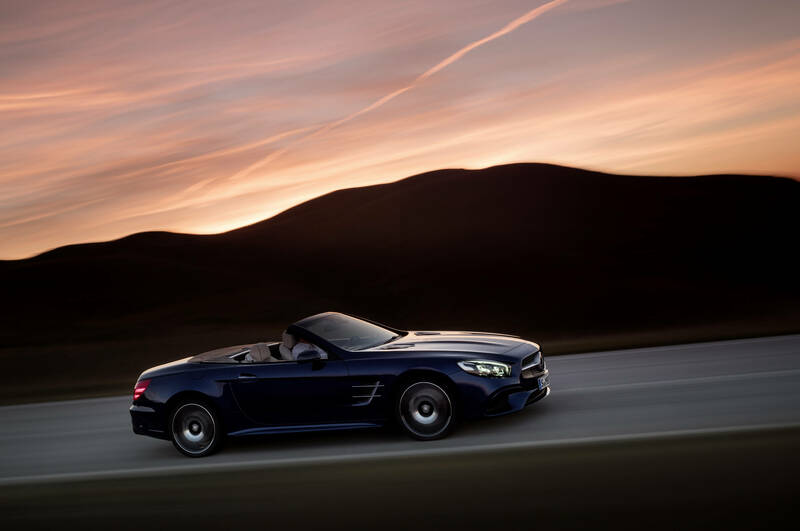 Also adding to the unmistakable new appearance of the SL is the new standard-fit LED Intelligent Light System with headlamp housing extending far to the outside and torch-shaped unit comprising the daytime running lamp/position lamp and direction indicator. The edge area and other design components of the headlamp housing are retained in black - conveying a high-level of perceived quality and an effective sense of depth. 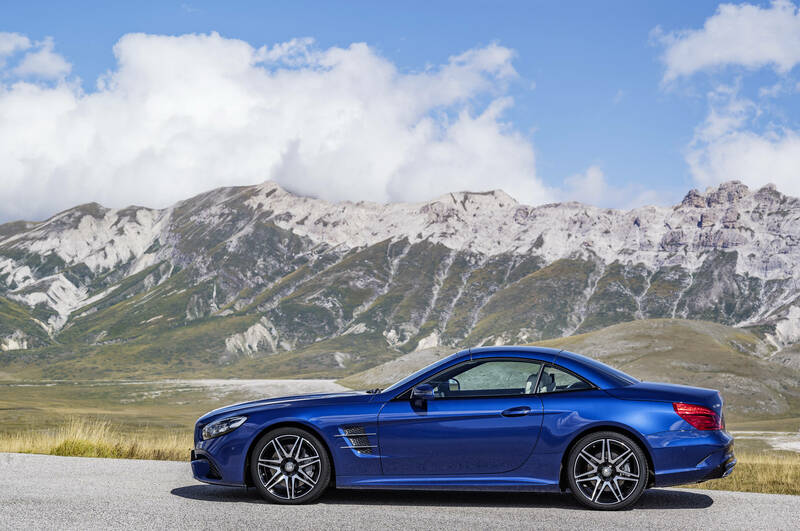 The side view of the SL reveals iconic sports car proportions, characterised by the long bonnet, the AMG side sill panels, the broad wheelbase and passenger compartment positioned towards the rear. Fine details create additional highlights. These include enlarged cosmetic air outlets with wing-like chrome inserts in the dynamic, broad vehicle wings. 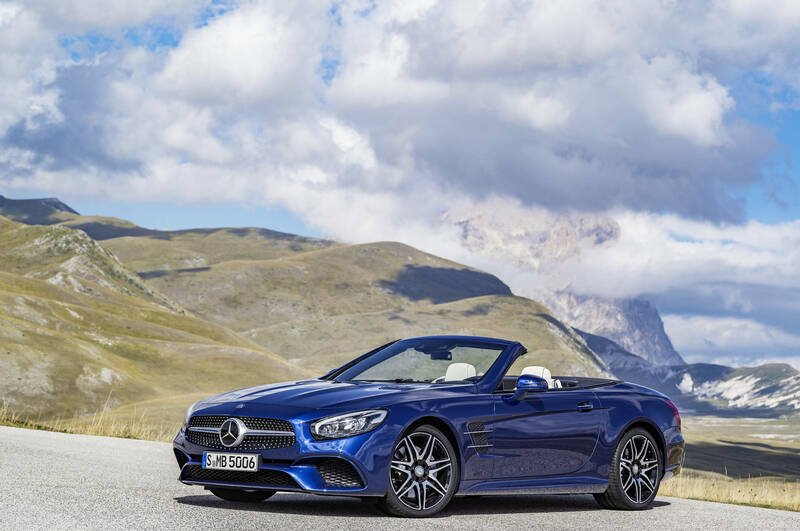 With the roof down the SL shows off its attractive roadster contours with short, steeply angled A-pillars and frameless side windows. There is nothing to disrupt the clear lines: all aerials, as well as the roll-over bar, are fully integrated and thus not visible, while the electric draught-stop (optional extra) can be extended and retracted at the push of a button. The rear end points to the high driving dynamics of the SL. The basis for this is the sense of width created by the large track gauge, accentuated by the AMG rear apron with side air intakes. The lower section of the diffuser incorporates the integral tailpipe trim elements as well as the centrally arranged rear fog lamp and reversing light. The broad, one-piece tail lights are entirely coloured in red and pick up the flowing lines of the vehicle sides and carry them into the rear. As is typical of the brand, they feature a horizontal design with the wedge-shaped direction indicator at the top and the tail lamp and also brake lamp below. Brilliant blue and designo selenite grey magno are available to choose from by way of new colours, plus the range of light-alloy wheels in the size 48.3 cm (19 inches) has also been extended significantly. New additions include a 10-spoke wheel and a 5-spoke wheel, both with a high-sheen finish in high-gloss black. 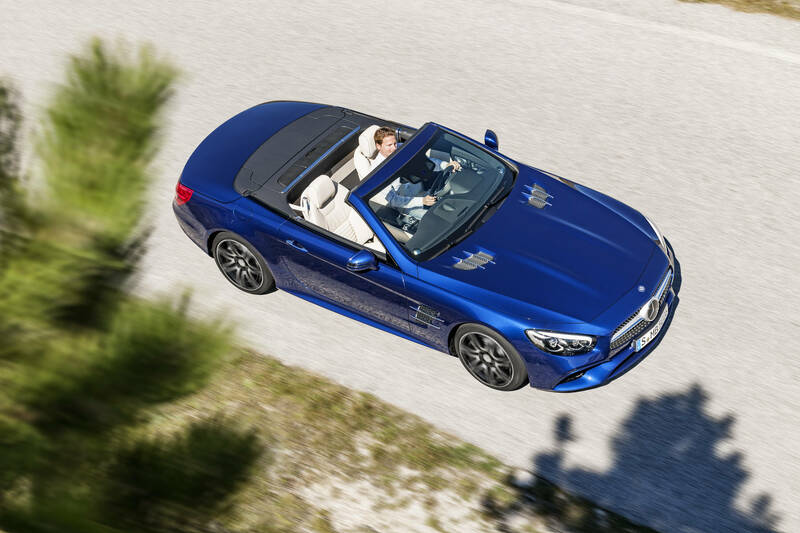 On top of this there are six additional new AMG wheels as part of the accessories range. 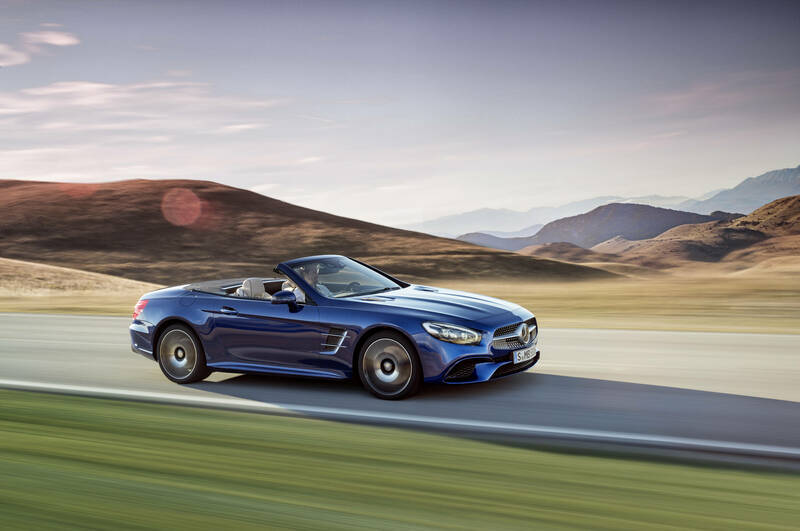 Minimal gap dimensions and fully padded beltlines are just two examples of the top-class standards which the SL also embodies in the refined interior. The ambient lighting with three selectable colours (solar red, polar blue, polar white) ensures an emotional lighting mood. The upper part of the dashboard forms a unit with the door beltlines, and four round air vents featuring an engine look create sporty highlights. The three-spoke sports steering wheel has a magnesium structure and features an ergonomic grip area and a high-quality finish. The airbag module too is finished in nappa leather with topstitching. Twelve control buttons provide access to the menu navigation in the instrument cluster as well as the audio system, telephone and voice entry. The steering wheel rim has a flattened bottom section, and silver-coloured steering wheel shift paddles enable manual gear changes to be made. The instrument cluster with 2-tube look for displaying speed and rpm combines classic circular instruments with modern display technology. Dials and pointers have a new sporty design. Up to 60 km/h, the speed scale is indicated in steps of 10. When starting up, the pointers move from the 6 o'clock position once around the entire scale and then return to the starting position. The driver is also greeted in style by the TFT multifunction display located between the circular instruments: on start-up it shows a front view of the SL. Lovingly designed details such as the analogue clock (optional extra) adorn the centre console. Its new graphic design is based on the instrument cluster. Depending on the transmission mode selected by DYNAMIC SELECT, the media display presents dynamic driving data: longitudinal and lateral acceleration (in a G-force cross) or torque and output. Comprehensive individualisation of the interior is possible with the broad selection of leather finishes and trim elements. The colour saddle brown is new in combination with nappa leather and Exclusive nappa leather. 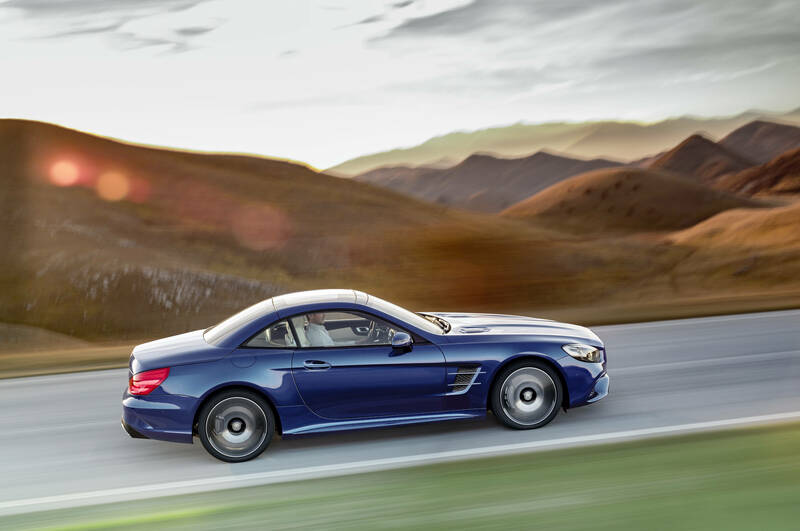 As standard the SL features Active Brake Assist, known as COLLISION PREVENTION ASSIST PLUS in other model series. In addition to radar-based proximity warning and braking assistance by Adaptive Brake Assist, this Active Brake Assist system carries out autonomous braking to reduce the danger of rear-end collisions. If the driver fails to act when a risk of a collision is detected, despite the warning lamp in the instrument cluster and the intermittent audible alert, the system will initiate automatic braking. This significantly reduces the vehicle speed. At low relative speeds, this intervention may be sufficient to prevent a rear-end collision with slower-moving, stopping or stationary vehicles. Distance Pilot DISTRONIC and Steering Pilot: assists the driver with maintaining a safe distance from the vehicle in front and staying in the centre of the lane. The radar and camera-based system brakes when necessary and accelerates again, if possible, to the preset desired speed. The Steering Pilot can take the strain off the driver when it comes to lateral guidance of the vehicle. On straight roads and gentle curves it generates steering torque which contributes to keeping the vehicle in the centre of the lane. To achieve this the system makes use of a stereo camera to orient itself based on clearly visible road markings and, at lower speeds, on the vehicle in front. Active Brake Assist with cross-traffic function: is able to warn the driver of impending crash situations, provide optimum support with emergency braking and if necessary also automatically apply the brakes itself. In addition to detecting slower-moving, stopping or stationary vehicles, it also detects crossing traffic at junctions, the tail ends of traffic jams and pedestrians in the danger zone ahead of the vehicle, for example.The PRE-SAFE® Brake is able to detect not only slower-moving, stopping or stationary vehicles but also pedestrians, to brake autonomously if the driver fails to react and as a result help to avoid accidents up to 50 km/h and reduce their severity up to 72 km/h. In flowing traffic, the PRE-SAFE® Brake provides assistance according to the same mode of operation throughout the speed range from 7 to 200 km/h. Active Blind Spot Assist: is able to warn the driver when changing lanes, for example, and can contribute to averting an impending collision by means of one-sided brake actuation. Active Lane Keeping Assist: is able to detect unintentional lane departure, warn the driver by means of pulsating steering wheel vibrations and contribute, by means of one-sided brake actuation, to guiding the vehicle back into its lane. PRE-SAFE® PLUS: if a rear-end collision appears imminent, the system can activate preventive measures to protect occupants. These include warning vehicles following behind and applying the vehicle brakes when at a standstill. The optional Parking Pilot can take the strain off the driver by helping him/her to search for a suitable parking space and making it easier to manoeuvre into and out of parking spaces with active steering intervention. A new feature is assistance with parking perpendicular to the road. The Parking Pilot includes six ultrasonic sensors in each of the front and rear bumpers which measure the size of the parking space when driving past it. In addition, the Parking Assist PARKTRONIC is also a part of the system. It provides visual and audible warnings of obstacles in front of and behind the vehicle, thus helping to avoid damage when manoeuvring. For optimum visibility on country roads and motorways, when cornering and on bends, the standard-fit LED Intelligent Light System automatically adapts to all light and driving conditions. The LED technology features low energy consumption, a long service life and a pleasant white light which approximates the daylight spectrum. The five functions of the LED Intelligent Light System include motorway mode, cornering light function, camera-based active light function, roundabout light function and also the enhanced fog light function. 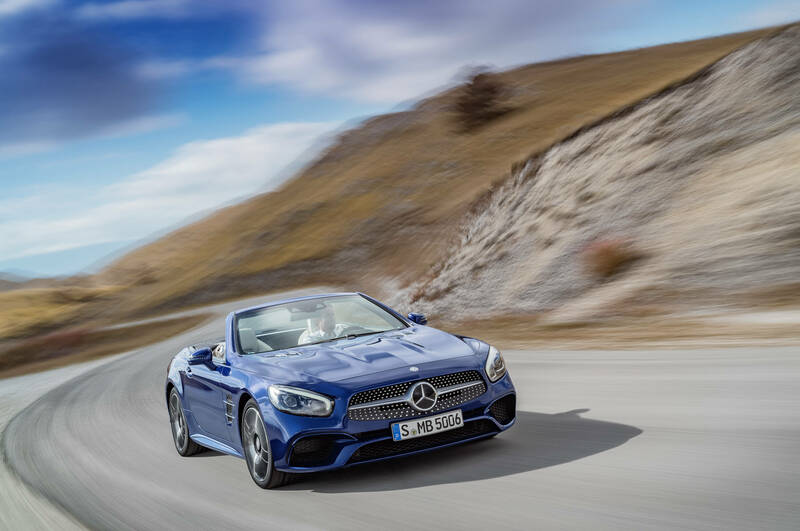 On unlocking the SL, the welcome light also greets the driver with an exceptional lighting display: the LED fibre optics in the headlamps light up in blue after opening the vehicle and then transition to white locator lighting. Anti-dazzle continuous high beam comes courtesy of the optional Adaptive Highbeam Assist Plus. When high beam is switched on, this system always makes the optimum headlamp range available. The driver can concentrate on the traffic and does not have to continually switch between low beam and high beam. Via a camera positioned behind the windscreen, the Adaptive Highbeam Assist Plus detects other illuminated road users, for example oncoming vehicles or vehicles travelling in front, and adjusts the headlamps independently to the new traffic conditions. A mechanism in the headlamp module masks the portion of the cone of light of the LED headlamps where there are other vehicles to prevent their drivers from being dazzled. The driver can therefore leave the high-beam headlamps on at all times and use their full range without bothering or endangering other road users. This function is active at speeds above 30 km/h when travelling in the dark on roads without street lighting. SL fans also appreciate the sports car icon on account of its high suitability for everyday use. With the facelift Mercedes-Benz has improved the comfort appointments even further. These include operation of the electrohydraulic vario-roof. If when opening or closing the roof the vehicle has to move off due to the traffic conditions, the process which was started when at a standstill can be continued up to a speed of approx. 40 km/h. Equally new is the automatic boot separator. If the separator is in the upper position for increased boot capacity, it automatically moves down when the top is opened. Conversely, the automatic boot separator returns to the upper position, also by means of electric operation, as soon as the boot flap is opened. A further practical detail in the boot is the loading setting - the roof stowed in the boot can be swung upwards by approximately 25 degrees at the press of a button. The KEYLESS-GO Convenience package includes remote closing of the boot lid as well as HANDS-FREE ACCESS. With this, the lid opens or closes automatically after making a kicking motion with the foot beneath the rear bumper. The automatic boot separator additionally moves into the upper position when opening the lid to provide clear access to the loading aperture. Another feature which has been retained is the unique optional extra MAGIC SKY CONTROL: when closed, the panoramic vario-roof automatically changes from dark to transparent or vice-versa within just a few seconds. When it comes to ambient lighting, Mercedes-Benz has opted for LED technology and has extended the colour range: in addition to solar red, the colours polar blue and polar white can also be chosen. A further practical finishing touch: the stowage compartment in the centre console now features two USB ports. One of the highlights is ambient lighting with projection of the brand logo. A further special feature comes in the guise of MAGIC VISION CONTROL, the intelligent and highly efficient wash/wipe system. The innovative design of the wiper blade always delivers washer fluid immediately in front of wipe lip, via the water feed line integrated into the blade - and it does this in both wiping directions. The result is that there is no gush of water when spraying fluid, which can impair visibility, and at the same time the maximum cleaning effect is achieved. In addition, the water stays on the windscreen, thus also enabling convenient cleaning of the windscreen even with the roof open. When the roof is open, the water is dispensed in such a way that no moisture gets into the interior. Optionally the wiper can be heated to prevent snow or ice from sticking in winter. It is with such details that the Roadster-Coupé underscores its exceptional position as a comfortable sports car suitable for all-year-round use. 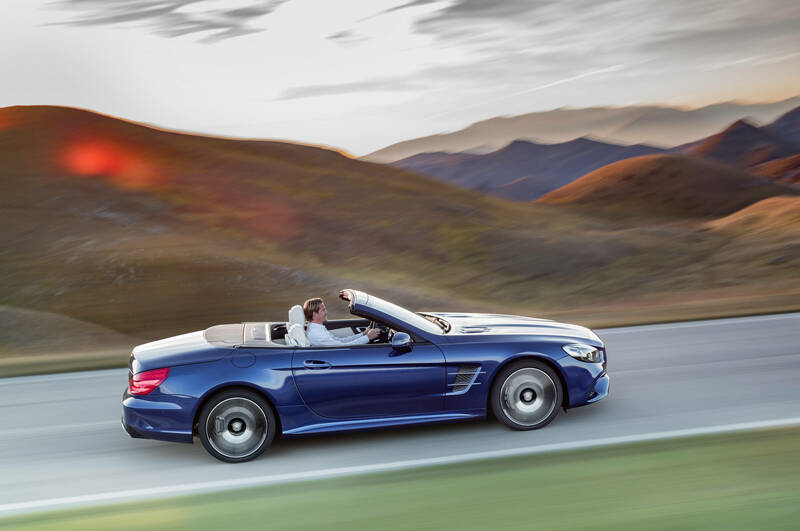 The new SL is intelligently networked and "always on". This is ensured thanks to the standard-fit communications module (on-board SIM card) which enables the use of Mercedes me connect services. The available Standard Services currently include Accident Recovery, Breakdown Management and Maintenance Management, as well as Telediagnostics, for example. Also available as standard is the Mercedes-Benz emergency call system. In an accident this service automatically connects the occupants with the Mercedes-Benz Emergency Call Centre and sends the position and status of the vehicle to the rescue operations centre. A rescue vehicle can then be dispatched immediately. The system works automatically, but can also be triggered manually. The optional Remote Online feature provides the technical basis for the SL to use Remote Services. For example, navigation destinations can be sent to the vehicle from a computer or smartphone. Geofencing, Vehicle Tracker and Parked Vehicle Locator, Remote Door Locking and Unlocking or Remote Retrieval of Vehicle Status - these are additional Remote Services and Tracking Services that can currently be activated separately from Daimler AG for three years on the basis of this technical preparation. With the Smartphone Integration package compatible smartphones can be integrated into the vehicle via Apple® CarPlay® and used via voice-operated control for example. In addition, the other vehicle controls can also be used. Safe and comfortable use on the road is always ensured. In the case of Apple® CarPlay® for example, the system supports making and receiving calls, navigation and listening to music, receiving and sending text messages and emails as well as Siri ® voice control. The selected apps from third-party providers that are also supported include Stitcher Radio® and Spotify®. The functionality of COMAND Online (optional extra on the SL 400) now includes internet radio as well as Live Traffic Information, for example. The latter service uses real-time traffic data for dynamic route guidance with more accurate arrival times. A concert room atmosphere even with the top down as well as less bulk in the doors due to reduced installation space are ensured by the Frontbass system, which celebrated its premiere in the SL in 2012. It makes intelligent use of the free installation space in the aluminium cavities in front of the footwell as resonating chambers for the base speakers. The optional Harman Kardon® Logic 7® surround sound system has a 10-channel DSP amplifier with a total output of 600 watts and 11 high-performance speakers including Frontbass. An even more sophisticated sound is produced by the Bang & Olufsen BeoSound AMG sound system. It uses a 16-channel DSP amplifier with a total output of 900 watts in conjunction with 12 high-performance speakers including Frontbass. Its twin-lens tweeters provide a futuristic show effect with LED light strips - adapted to instrument lighting. The B&O-specific COMAND Menu True Image™ enables individual special settings to be made. The steel suspension of the standard chassis features continuously variable dampers. In conjunction with the AMG Line equipment the suspension is lowered by 10 mm and fitted with harsher springs and torsion-bar stabilisers. The driver can leave the setting of the basic characteristics of the suspension to the control electronics via DYNAMIC SELECT - from comfortable to extremely sporty in the new third Sport+ mode. Individual (I) allows individual adjustment of the various parameters to suit the driver's requirements. Alternatively there is another option available in the guise of Active Body Control (ABC) with curve tilting function. ABC reduces body movements when moving off, braking and cornering. The spring struts of the ABC suspension are adjusted to the respective driving conditions via so-called plunger cylinders (via oil pressure), therefore making torsion-bar stabilisers on the front and rear axle, which can reduce comfort, unnecessary. The dampers only have to eliminate wheel vibrations and can be set up in such a way as to ensure comfort without losing any of the sportiness. In addition, the vehicle level can be adjusted to any unevenness: At higher speeds the SL is automatically lowered by 13 mm for more favourable aerodynamics. Conversely, at the press of a button it is possible to raise the vehicle by 50 mm for driving on rough roads. 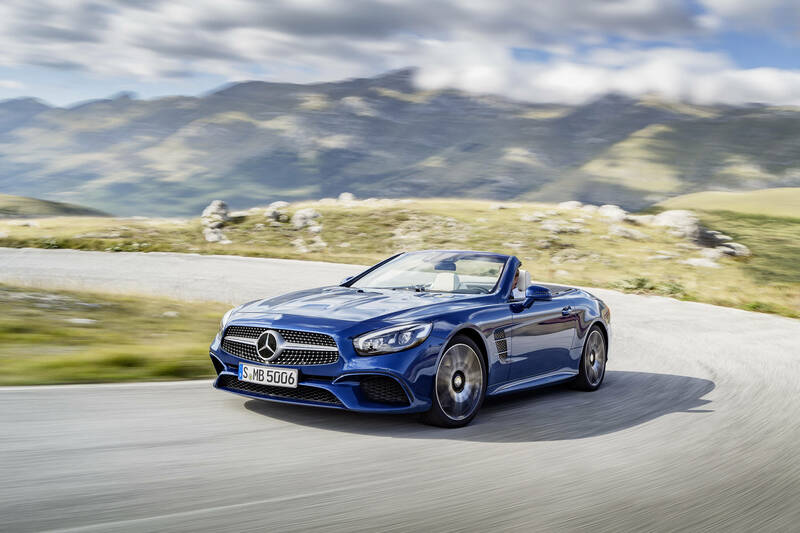 The latest generation of the Mercedes-Benz SL takes the meaning of the well-known abbreviation "SL" - Super-Light - literally at its word. Systematic weight reduction is just as much a part of the outstanding design features of the new SL as it was for its namesake, the original SL from 1952 with its lightweight tubular frame. Here for the first time Mercedes-Benz has implemented an all-aluminium bodyshell as part of large-scale series production. Only relatively few components are made using other materials. High-strength steel tubes are integrated in the A-pillars to increase safety. The aluminium bodyshell weighs around 110 kg less than if it had been produced using steel technology. The aluminium structure is not only lighter, but also superior in terms of rigidity, safety and comfort. This is thanks to intelligent lightweight construction with components optimised for their respective intended purposes. For example, different types of aluminium processing are used. Depending on their function, the components are produced using gravity die casting or vacuum die casting, made from extruded sections or used as aluminium sheets of a variety of different wall thicknesses. The result is high levels of rigidity and safety as well as better vibration characteristics. 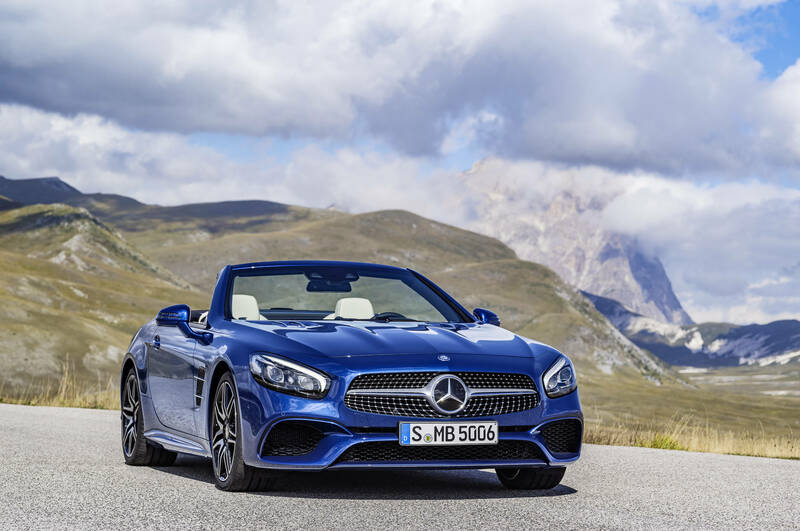 With its intelligent lightweight construction, which also comprises new bonding techniques, the SL has also become a role model for the current S-Class. The total of six models in the luxury class are characterised by a high percentage of strategically deployed light alloys such as aluminium or magnesium. 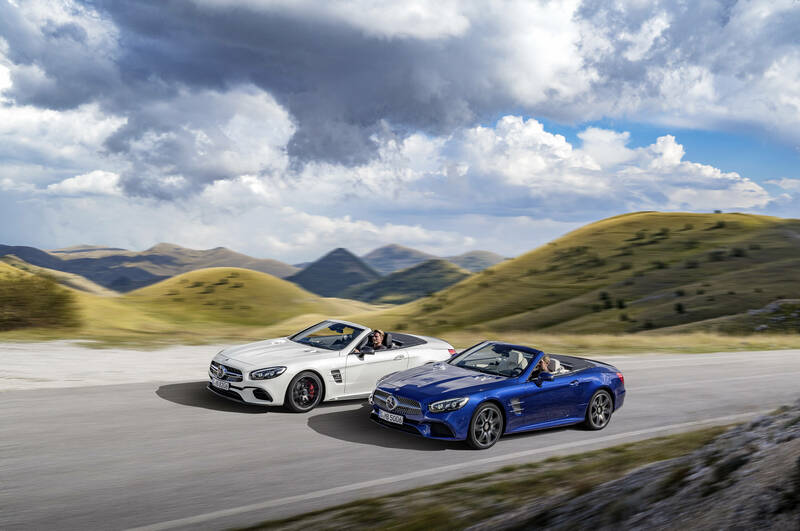 The exceptional position occupied by the SL in the history of Mercedes-Benz is also evident from its very name: due to its iconic status, the SL has retained its tradition-rich model designation even after the introduction of the new nomenclature. 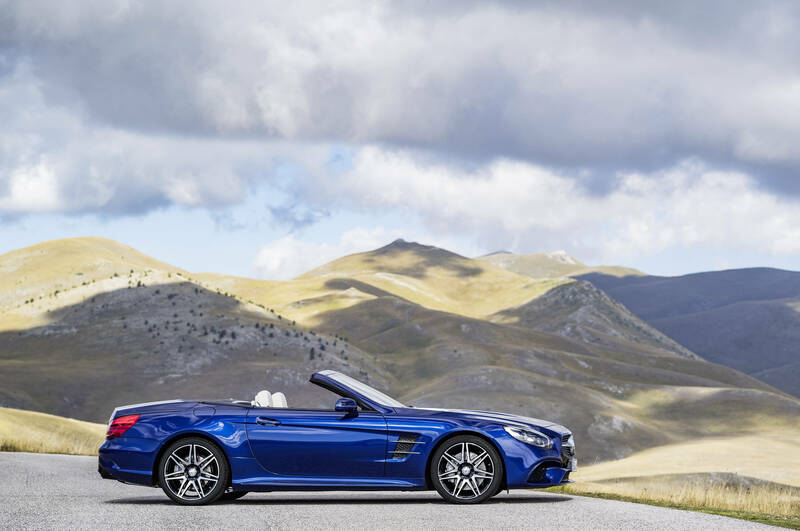 For more than 60 years now, the Mercedes-Benz model range with the "SL" acronym has enthralled sports car fans around the world.